Not a day goes by for those of us in the antique and collectible business that someone doesn’t inquire about the relative value of an item or treasure. With the popularity of “Antiques Roadshow”, “American Pickers” and other TV programs, more and more people want to attach a dollar value to a piece of personal property that they have found, picked up at a yard sale or inherited. What was popular, desirable and collectible 20 to 30 years ago, may not be so today. Every generation has somewhat different interests and places value on different items. Not that long ago, oak furniture from the late 19th to early 20th century was very sought after and commanded high prices both at auctions and in antique stores. Today that interest is waning, with these pieces bringing far less in the marketplace than they did decades ago. Inversely, one of the post popular styles of furniture today for collectors is what is called Mid-Century Modern, or Danish Modern from the late 1950’s through the 1960’s. This simple and sleek contemporary style continues to grow in desireability and in price, especially in urban areas. A lot of items deemed as a collectible over the last 30 to 40 years usually aren’t. Starting in the 1960’s a number of companies sought to capture the growing market of people who were collecting things. These companies mass produced millions of instant “collectibles” and sold these items at premium prices. Indiana auctioneer, Jack Christy, calls these items “desirables” and not collectibles, because these items did and do bring pleasure to their owners. Unfortunately, just about all of these “special, limited edition” plates, statues, dolls etcetera are worth today a fraction of what they were sold for new. As a general rule, we tell people that if it says, “Collectible” it probably isn’t a collectible. I believe desirability changes with the times and things that have sentimental value, from our childhood or from our own heritage make items more important. I personally collect and am knowledgable of mechanical wrist and pocket watches. As time goes by (escuse the pun) I believe there will be less and less interest in these things. Pocket watches, with the exception of the best of the best, have been declining in value in recent years. While I, being a baby boomer, can recall as child seeing older gentlemen still using pocket watches, that might well be one of the last generations. Most young people today tell time with their phones and don’t even wear a watch. Note, there has been a renewed interest in higher end mechanical watches in recent years, but there is a limited market for these watches than can sell for as much as a brand new car! The world of antiques and collectibles is changing rapidly. Each year fewer price guides are being printed, because the information is easily found online and is current and not dated. Some categories are starting to disappear, because a new generation of collectors hasn’t emerged to replace the ones who are passing away, downsizing or selling their collections. Is collecting a fading past time? Not at all, just the items being collected are changing and so are the relative values. One of the first Apple computers ever built in 1976 is expected to sell for close to $500,000 at auction. What’s it worth? Your treasure is certainly worth the joy of the hunt, the knowledge gained in learning more about it and, if you do wish to sell it, it’s worth whatever someone will give you for it. Terry Mangum is a Professional Auctioneer, Realtor & Personal Property Appraiser. What’s Hot – What’s Not! What’s Hot – What’s Not! The following is a short list of items we see doing better and not so well at auction these days. We’ll continue to update this over the coming months. Are you wearing the same clothes you wore 10, 15 or even 30 years ago? I’ll admit I have a belt and perhaps a tie or two I’ve had for a while, but none of what I wear regularly is of that vintage. 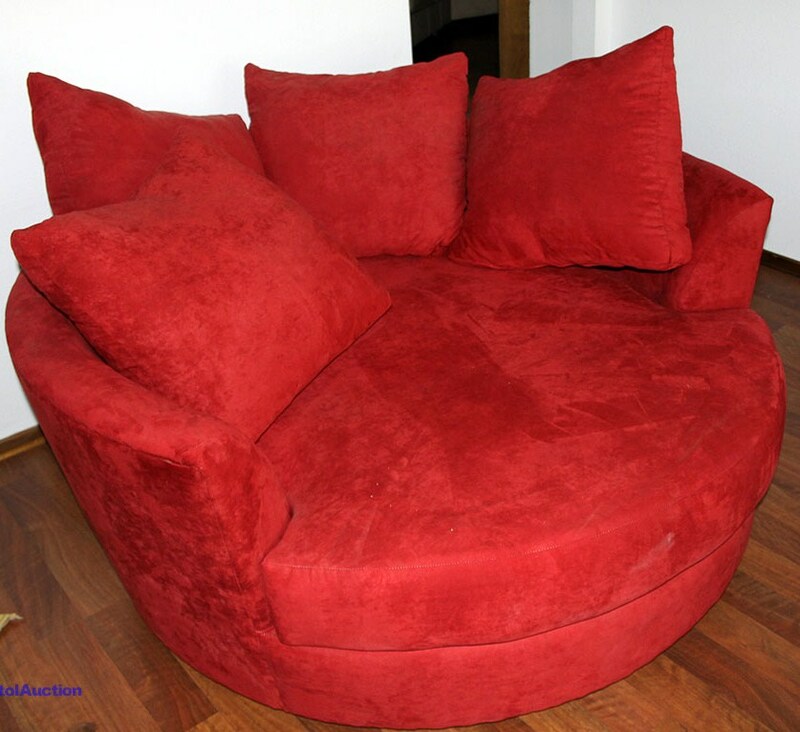 However, many of us, if not most of us, on a daily basis use couches, tables, chairs and other items of furniture that we have had for many, many years. The point I’m trying to get to, is that while our furniture serves its function quite well, it’s usually, if it’s of a contemporary nature, not worth a whole lot to someone else because it reflects a style that’s no longer “in style”. Because of its expense and the headache of moving it, most of us don’t change out our furniture on a regular basis. Often time, furniture is bought to fit a new home a family moves into and there it sits for many decades to come. Adding to the dilemma of selling furniture, even more recent pieces, is that element of fashion again. The colors one might have wanted to match some other design element might not be at all what a potential buyer might desire. We all have our own unique sense of style and seldom does it translate to someone else. Furniture can be nice, fun and functional, but with few exceptions, its value does not appreciate. In most cases, it is worth today far less than what we paid for it many years ago. Just like that 10 year old jacket! Once or twice a month we have an auction. Our events usually last just a few hours and before you know it, we are done for the day. Our customers get the opportunity to bid on and win interesting, useful and fun items and our consigners end up with a nice check a few days later. So what happens after the popcorn machine is turned off and the doors are closed? Let me tell you a bit about what happens behind the scenes. To the above, add the daily tasks of running and maintaining an office. Not to mention taking out the garbage, running to get more computer paper and trying to find that one reference book that will tell us a bit more about some of the interesting glassware we have coming up for auction. In a way, it’s kind of like that movie of Bill Murray’s called “Ground Hog Day” in which he has to repeat the same day over and over, because after each auction, after we get the popcorn swept up, we start the process all over again. Unlike the movie, we do get a change of scenery and things do unfold a bit differently, but somehow in a similar way as we race towards the next auction date. This is an exciting business. It’s allowed us to meet many wonderful people, heard some incredible stories and led to us handling a lot of interesting items. Best of all, we have the satisfaction of knowing we have been of service to most of these people too. Pretty much everyone agrees, most Antiques and Collectibles aren’t worth the value they held just a few years ago. Some dealers and auctioneers think that many items are down 40-60% from 5-10 years ago. Inversely, the coin and metal collectors have enjoyed a huge upswing in recent years. 5 years ago, Gold was selling for about $550 per troy ounce. Today it is over $1400 per ounce! A little over two years ago, Silver was priced under $10 per ounce. It topped $30 at the first of 2010. Who knew we’d be seeing these values just a couple of years ago? Many people, in discussing their collection remark, “I’m not going to sell until the market comes back. I’d rather keep my __________ rather that just give it away.” Most of us have felt that way at one time or another, whether we are talking about Depression Glass, Oak Sideboards or even Real Estate. Early in the housing bubble bust, I heard people say, “If I sell now I’m going to lose most of my equity. I’m waiting!” Little did they know that a 10% drop would soon become, in some areas of the country, a 50% drop and that it might be 10-20 years (if in our life time) before prices even approach peak values again. I don’t know where prices and values are going, but I do try to be realistic about many of things I collect. These items have brought me pleasure in acquiring them, researching and enjoying their unique qualities. When the time comes to sell or trade, if the value is less than I acquired them for, I try to think of that loss as my cost of ownership. If I enjoyed it for 5 years, then in reality my cost of ownership was minimal. My car out in the driveway isn’t worth what I paid for it 5 years ago, yet I’m OK with that. Now if I had only bought some Gold and Silver back then! Collectibles can be just about anything, because almost anything can be collected. Remember the big ball of string you may have seen in the Guinness Book of World Records? Obviously that was the serious work of a string collector. TV personality Jay Leno collects expensive classic cars and I know a 5-year-old who collects Legos. For most, the joy of collecting is in the finding, the researching and adding to their respective collection. Many enjoy displaying their treasures and gathering regularly with other collectors of similar items. Some people collect with the belief that may make money from their collection or will at least retain value in the items they have acquired. While this does happen at times, markets change and so do the whims of the collecting world. Shirley Temple was a huge star in her day, but the value of collectibles related to her hasn’t appreciated like Superman’s first appearance in 1938. But back then, who would have known? At the time, she was a lot more popular than the brand new comic book caped crusader. In recent decades collecting has become serious business. Companies like Franklin Mint sprung up to create hundreds, if not thousands, of instant collectibles, which sold like wildfire. However, many of the “limited editions” from these companies aren’t that limited, resulting in a deluge of items reaching the secondary market. As an example, many Danbury Mint die cast collector cars, sold several years ago for $100 or more, bring as little as $20 to $30 on EBay these days. None of us can predict the future of any given market, whether it be the Stock Market, Gold Market or the Collectible Market. The truly happy collector is one who collects for the joys and pleasure of collecting and not for the potential monetary return. As a side note, if something is marked and marketed as a “Collectible”, it usually isn’t. Hope to see you at the next Auction! I spend a lot of time going to auctions and sales, both as a collector and to observe how other people conduct their business. The more I do this, the more it reinforces to me how well the “auction method” of sales works. •	You know when the item will sell! Not next week, not next month, but exactly on the date you have the auction. •	The price is determined by all the bidders, not just one or two people marking price tags. No one is an expert on everything, but when you have the benefit of 80-100 people on the auction floor plus another 100 registered bidders on line, you are going to get a true read as to what that item is valued at on that day. •	No Negotiations, no haggling. It’s sold. Period. How many times on Antique Roadshow do you hear someone say, “I paid 5 dollars for it at an estate sale,” and the item is worth hundreds if not thousands? Don’t know that I’ve ever seen an item come up on the Roadshow where someone says they bought an item at auction and it turns out to be worth 1000 percent of what they paid. 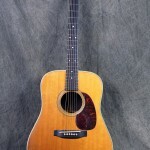 On Saturday, May 8th, Capitol Auction will be auctioning off a rare 1948 CF Martin D-28 guitar. Even if you don’t have an interest in guitars, you’ll want to see this one. Besides being 62 years old and made from the finest of woods (Brazilian rosewood, spruce and ebony) it has a heritage that dates back to 1833 when the Martin guitar company was founded. CF Martin came to America from Germany during the first half of the 19th century and his descendents, in Nazareth, Pennsylvania still run this distinctive company. In fact, CF Martin IV is the current CEO. 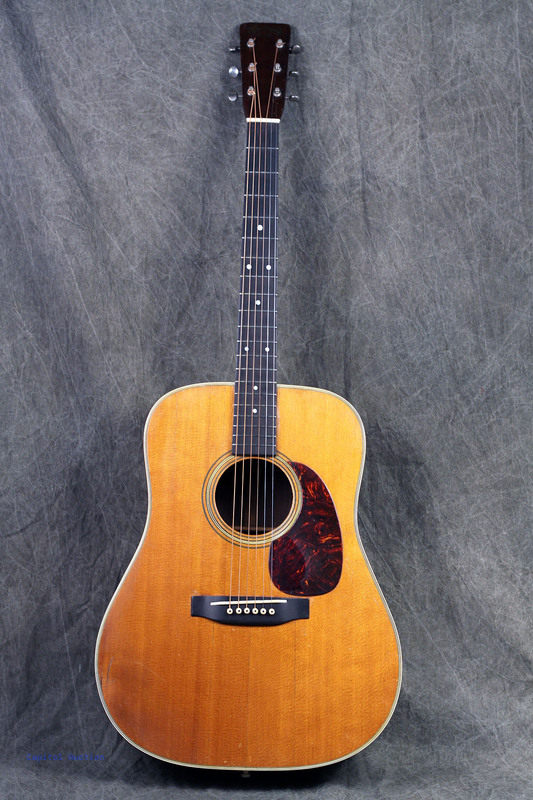 While guitars come in many shapes and forms the iconic one that we think of; the one that Roy Rodgers, Johnny Cash, Crosby , Stills, Nash & Young and John Mayer played or plays today is a Martin. 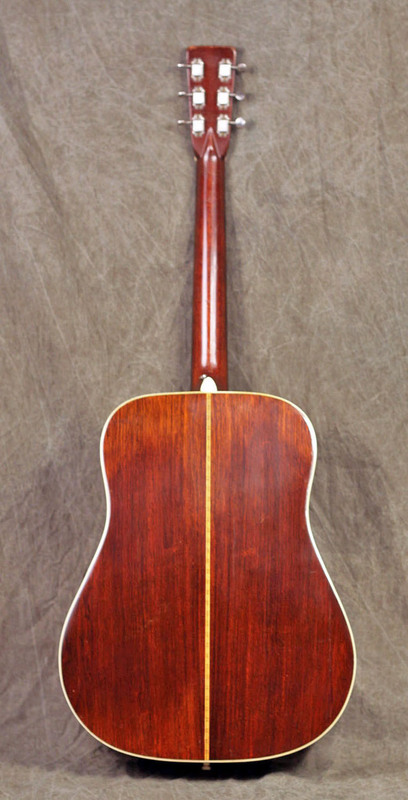 Here’s a picture of the Martin we have for auction. 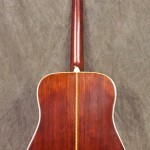 It has a very distinctive, “woody” sound that befits its age and character. Thanks for reading and I hope to see you on Saturday, May 8th. Who knows, maybe this fine guitar will go home with you! My wife and I got into the auction and estate business for a variety of reasons, but one of the main ones was that we like to collect things. Over time our interests have changed a bit, but the enjoyment of searching for and researching different types of treasures still remains one of the highlights of our spare moments. One of the fun parts of our job is talking with other collectors. Everyone has their passion and whether someone collects postcards or Victorian furniture or tractor seats, they have their own distinctive stories about the search and discovery of their many treasures. I’ve even heard stories of collectors who liquated their entire collection and then started over – searching for more elusive items! 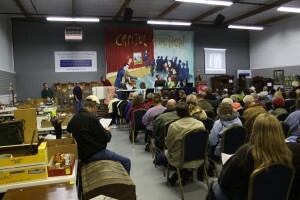 We hope, at Capitol Auction in Salem, that we can help you find one of your treasures. 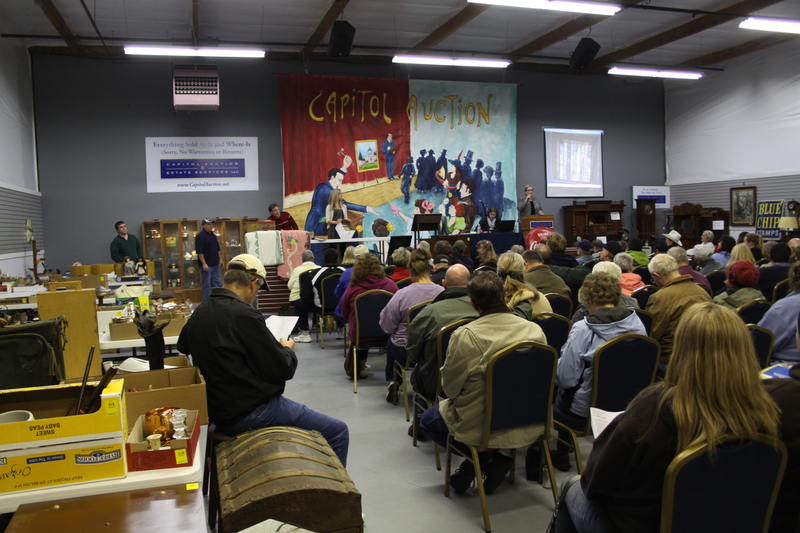 If you attend our auctions, please be sure to let us know what you’re looking for. As collectors, we know that you can never know when you might come across the next find. If you watch Antiques Roadshow on PBS, then you probably, the second an item is introduced, start guessing what it’s worth. My wife and I play this game to see how close we can come to what the expert appraises the item for at the end of the segment. Patrice seems to think the uglier the item is, the more likely it is to be rare and valuable. I, on the other hand, get sucked in by the stories about how Uncle Frank brought this ceremonial mask back from Timbuktu at the turn of the century after saving the King’s life. Many times I’m left a bit baffled when the value is given, because it usually comes off as a very vague guess. Saying that Uncle Frank’s treasure is worth between 1200 and 1600 dollars to me is not unlike a car salesman remarking that I can buy that new car for between 20 and 30 thousand. I’d kind of like to know a closer number, although I understand it is hard to pin down at times. 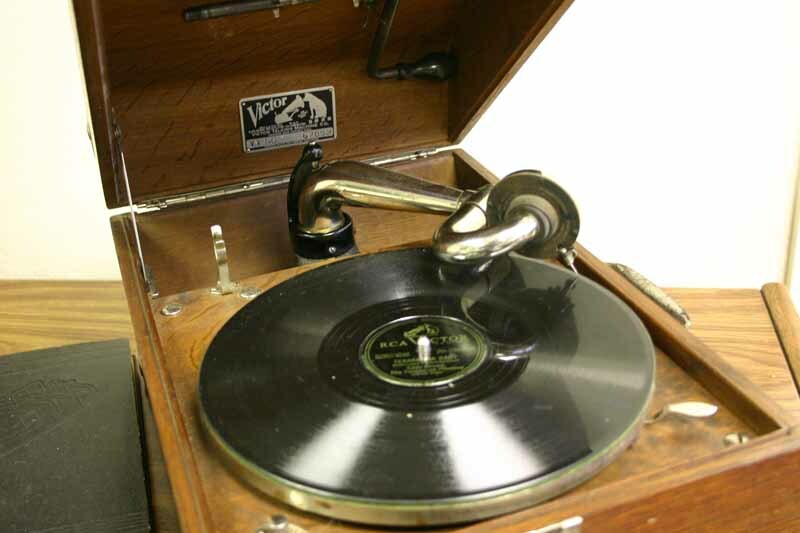 We are always making the rounds of the assorted antique stores and shows in the area and there are some items that we have been looking at for years – and the price has never changed! One would hope the seller would eventually realize that if they want to sell their item, some adjustment is coming to have to be made in terms of price. Auctions are one of the best ways to determine value. If the auctioneer has done their job right, then they’ve assembled a knowledgeable group of potential bidders and the winning bid will determine what the value was on that given day. I always ask back, “Well, did they offer to buy it from you for $100?” Of course, the answer is no. So maybe that widget really wasn’t worth, at least at that time, the price they were quoted. What’s it worth? It’s worth what someone will pay. Period.